Most of times you do not need any tricks, but sometimes when you translate your application to some specific language you might see that some symbols do not show. To solve this situation we recommend you to change used font. You can do this from options dialog in the Java Properties Editor. 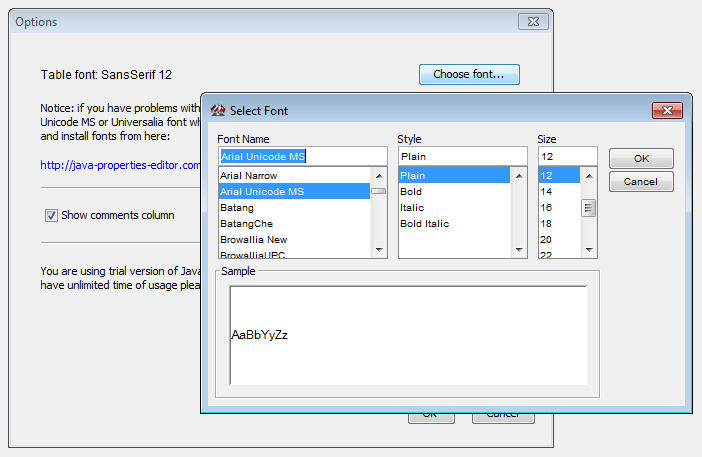 Often your OS already has the fonts which support your target language. But in case they do not, please download and install one of these fonts to your computer. Click on one of these links and download a font to disk. Open folder containing the font, do right click over downloaded font and press "Install font"
If you are using not Windows platform please read your system's manual about how to intall fonts there. These fonts are 100% compatibl also with *nix platform (including Linux, BSD). Reopen Java Properties Editor and go to File→Options. Press Choose font button there and select your font there.